As strange as it may sound, that was the question someone asked. And the following questions are his own words. It seems that traveling on a kosher cruise is too tame for some. They want to know just how close you can get to the flame without actually being burned. The answers are mine, though I would love to hear from you about this topic. Q: Can I order a salad without dressing on a non-kosher cruise? The waiter can bring me a bottle of dressing so that I can see that it has a hechscher. Often they have kosher packets. Non-leafy vegetables e.g. tomatoes, cucumbers, carrots, etc. are easy to see that they are bug free. If a person wants leafy vegetables he could order iceberg lettuce, and check it on his plate. It is usually clean. Agreed; however, one cannot use cut onion, radishes, etc. due to the possible use of non-kosher knives. A. Absolutely not. Salads in restaurants are not usually the Israeli type with just tomatoes and cucumbers, perhaps a pepper. You can find non-kosher meat, chicken, fish or cheese thrown in. We have heard the stories from those who did find their “kosher salads” were glatt treif. It is totally impractical for you to examine lettuce on your plate. You need proper lighting, sufficient time, and the mindset to do that, as well as the training. While your wife/children are becoming impatient is definitely not the time for this. Q: Can I eat sashimi? Sushi needs rice and there are issues of bishul akum as well as the cooker being not kosher. On the other hand sashimi is just thinly sliced fish. One can inspect for scales on the fish prior to slicing. A. Sashimi is raw fish, but only some fish are able to be used and they are prepared in a way that they need supervision. Many of the possible “fish” that are commonly used are squid, octopus, takifugu (puffer fish), scallop, sea urchin, and whale meat (yup, whale meat). Sometimes beef, horse meat, or chicken are used. Checking for fins and scales is impossible since the fish is specially prepared way in advance. To keep the fish fresh, this is the procedure that is followed. 'Sashimi Grade' fish is caught by individual handline. As soon as the fish is landed, its brain is pierced with a sharp spike, and it is placed in slurried ice. Ice slurry is itself a product using a number of ingredients. This spiking means that the fish will keep fresh on ice for about ten days without turning white or otherwise degrading. Q: Can I have the staff cook fish, vegetables, etc. for me if I have it double-wrapped in foil? There are two issues of concern. 1. Is the fish kosher. That one is easy to accomplish by seeing the whole fish before wrapping with at least one scale still in it. Of course this will necessitate oversight to be sure that what I gave to the non-Jew to put into the stove was not compromised. 2. There would be a prohibition of bishul akum, since a Jew must cook anything that cannot be eaten raw such as fish or meat. The resolution would be for me to light the fire or to use a fish that could be eaten raw. A. You’ve answered the question with the question itself. No one will go through the myriad of details you’ve mentioned that are necessary to avoid bishul akum. As to eating fish raw, there are some who claim that, since many people eat sushi raw, all fish should no longer be subjected to the limitations of bishul akum. This leniency based on sushi that some espouse is being misused. As with the sashimi above, a person will not eat all fish raw, but will first treat them in some way. Instead, sign up for a truly kosher cruise. I was early for a bar mitzvah celebration and struck up a conversation with the gentleman seated next to me. When he told me his story about the man he calls “the rebbe,” I rushed home and recorded it for KASHRUS Magazine. One day, he found himself inside Yeshiva Torah Vodaath where he observed the Rosh Hayeshiva, Rabbi Yaakov Kamentzky, during his davening. He watched the Rosh Hayeshiva during the entire repetition of the Shmoneh Esrei and was happy to find him closely following along in his siddur, each and every word. That saved our young friend from his challenging thoughts. At least someone, the Rosh Hayeshiva, follows the Shulchan Aruch! Some friends asked him to join them in visiting the Skolye Rebbe, Grand Rabbi David Yitzhak Eizik Rabinowitz (1898-1979) for shalosh seudos. It seemed strange to him to go to a rebbe and so he refused a number of times, until once when he finally tagged along. Our friend was shocked to find who else was attending the shalosh seudos, none other than the Rosh Hayeshiva of Torah Vodaath, Rav Yaakov Kamenetsky himself. Then, at one point, the rebbe handed over a Chumash to Rav Kamenetzky and asked him to pick a posuk from the parsha of the week. The rebbe then proceeded to deliver a lengthy drasha on that posuk. When the entire story repeated itself the following week, with Rav Kamenetzky again selecting a posuk and the rebbe delivering a drasha on it, our friend realized that the rebbe was very special, and he was determined to meet with him. Eventually, he became very close with the rebbe and did not make a move without consulting him first. At least three times he wished to switch jobs. But, before he did so, he would speak to the rebbe for his approval. The first time he asked, the rebbe asked him back who would he be working for at the new job, was our friend happy with that person, and was that person desirous of hiring him. Our friend replied that the interviewer had been very happy, but the rebbe was still not moved. He inquired again, and this time he learned that the one who would hire him would not be his boss, but that someone else, a man with a deep dislike for Jews, would be the boss. Now, our friend had already put off the managers at the new place for several days and other candidates were being interviewed. Still, the rebbe said not to say yes until after the weekend. What could he do? On Monday, he called and learned that that department had been closed, with each employee receiving a pink slip. Fortunately, he had not tendered his resignation and he still had his old job. There is one more story that remained in my mind, as I returned from the bar mitzvah. It was truly uncanny. In the early days, our friend had a menial job, which earned him very little indeed. When a certain gentleman offered him $10 to drive him to the Skolye Rebbe, he jumped at the opportunity. When the rebbe said those words, the man broke down crying in admission of whatever it is that he had done. Then, he approached the rebbe and begged him for a bracha. The rebbe gently pushed the man’s head onto the table, placed his hands on his head and gave him a bracha for his mother to heal. “It’s all about respect,” says Barry Nash, as I interview him the first time. Mild-mannered and respectful, Mr. Nash does not yet know that we are interviewing him as a possible awardee of the “Mashgiach of the Year” title. “I empower people. We help each other. Everyone knows what they have to do. They all want to be part of an important thing. Maybe they don’t know what kosher is, but I get them to feel that they are part of the team. “They look at me and say, ‘Look at what Barry did.’ Then, when I ask them to do something, they feel impelled to cooperate, on their own. That’s kashrus to Barry Nash: teamwork, mutual respect, hard work, and lots of love. “I am a mixed-breed; my father was from Cuba, a Cuban Jew, and my mother’s side was from Lithuania. Barry Nash entered the field of kosher supervision after a career as an electronic development engineer. Once he had read a good deal about kashrus, a friend of his who owned a pizza store drew him into kosher supervision. Eventually, he came under the tutelage of Rabbi Meir Brueckheimer of the Rabbinical Council of Bergen County (RCBC) for whom he worked ever since. 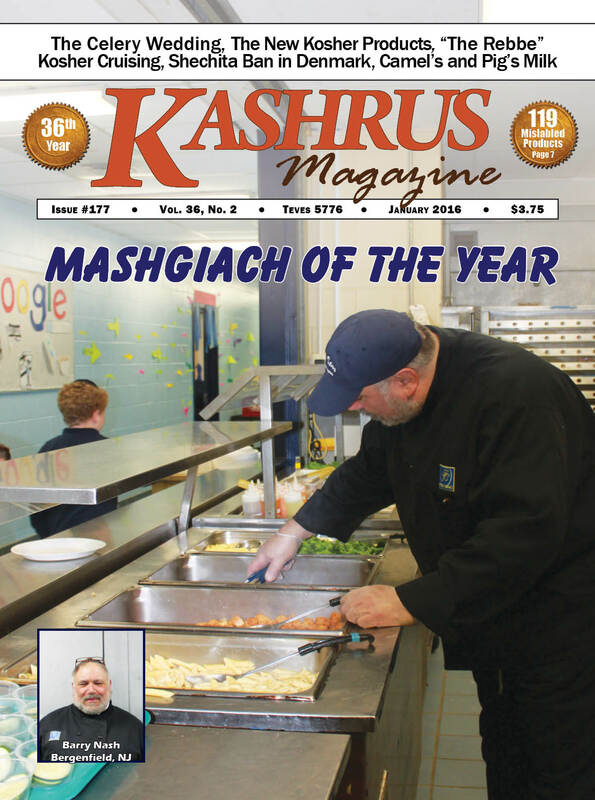 Barry Nash, caring, dedicated, and directed, has his impact daily for 21 years as the mashgiach at Moriah School, a large New Jersey yeshiva, the Moriah School in Englewood. With over 900 students, Moriah is dedicated to helping each child with their diet restrictions, whether they are due to allergy or illness. Barry embraces the daily challenges and searches for what he calls “happy meals,” alternative opportunities for the diet-restricted. He will search for cookies without eggs, ices that approximate ice cream, etc. to create student specific meals or noshes, so that every child will feel included. Getting the product that is acceptable to an individual student is not always a one-time thing. It may necessitate a constant set of purchases and production. If they can’t order it easily, Barry will shop for the item, sometimes necessitating him going to the producer and making the product pas yisroel. Once purchased, or after the final food is produced at Moriah, this food item needs to be segregated in a way that is clear to Barry and the food staff who it is prepared for or what it is exactly. “Let’s say we have a cookie prepared without eggs or a pareve dessert. That has been prepared so alike the one that the rest of the school will get that special “signs” are needed to identify it. Every day! No small feat in such a busy facility. Barry’s work at Moriah is a labor of love. Hear it in his own words. “You’re there for the kids. You’re there to feed them kosher food. You’re there for their neshamos. To read the rest of this article, click “Buy this issue now” or “Subscribe” at the bottom of this page.